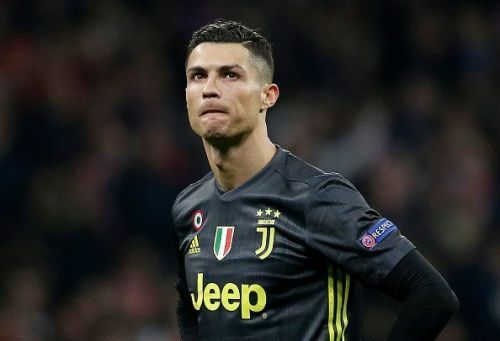 After Atletico Madrid defeated Juventus with a 2-0 victory at their home stadium, Juventus star Cristiano Ronaldo mocked Atletico Madrid when leaving the stadium. Former Real Madrid forward's return to the Spanish capital was an unhappy one as Diego Simeone's team took advantage of the home leg with a victory. Cristiano Ronaldo left the Estadio Wanda Metropolitano a little disgruntled. During the game, the Juventus forward responded to the Atletico Madrid fans by holding up his five fingers to indicate the number of Champions League trophy he had won. Then as he left the stadium he reiterated the point while also making a gesture of one hand open -5- before making zero to indicate: "I have won five Champions League and Atletico have none". The Portuguese forward was jeered throughout the match at the Wanda Metropolitano Stadium. His response was unequivocal and impossible to argue with having won the Champions League four times with Real Madrid and once with Manchester United. But this year, it will take special efforts to reached to next stage and to increase his Champions League tally to six. Juventus need to produce tremendous effort in the second leg of the round of 16 at Allianz Stadium. Juventus boss Massimilano Allegri still holds out hope that his men will be able to turn it around. 'We were not dead after the 3-0 home defeat against Madrid last season and we are not dead now,' Allegri told UEFA.com. 'We have to forget this defeat quickly and try to play better in Turin because against a team like Atletico you miss a pass and you are in trouble. 'We'll have some players back and there's no point crying over spilt milk. We got the approach wrong in the second half - it's that simple. These things can happen.